That building is currently a support centre for cancer survivors and those going through the recovery process. It's a deep lot. But I don't know if a tower could be easily set behind the house. There's also a coach house at the back, that I can't see remaining if a tower is planned for the site. I wonder how the price went from 3.2M in the ad to 4.5M selling price. Was there a bidding war? It's not like this is going to be more than 25 or 30 stories max., it'll fit the lot just fine. It's a hell of a shame to lose these buildings though. According to a Twitter post yesterday by Urbanation, a research and consulting firm that tracks Torontoâ€™s condominium real estate market, 81 Wellesley Street East has been sold for $4.5 million, with a â€œfuture high-rise condo site planned.â€ The property, which includes the 5,000-square-foot, 3-storey Odette house fronting on Wellesley Street, and a 2,200-square-foot, two-storey coach house behind it, was owned by the Wellspring cancer support centre. Wellspring decided to sell the property not only since it was outgrowing the site as it provided additional services to meet steadily growing demand, but also because it was becoming too expensive to operate from the two houses. One resident who told me nearly two months ago that the sale of 81 Wellesley was imminent also said he has heard that a developer has a large condo tower in the works for the Wellspring site and the adjacent property to its west â€” a four-storey brick apartment building with street-level retail at the southeast corner of Church and Wellesley Streets. An H-shaped structure constructed in 1926, that building has street addresses of 77 Wellesley Street East and 501 Church Street. I asked a member of the Cityâ€™s planning department staff last month if a condo tower has been proposed for the corner, and was told no development applications had been filed. However, the planner did say that since Church & Wellesley is among several downtown areas facing significant â€œdevelopment pressure,â€ itâ€™s quite possible someone will seek to build a highrise there. Wow. Thanks for that post. Let's hope whatever goes in is either a lovely miracle of adaptive re-use, or at least a worthy successor. The brick building on the corner is awfully cute, I'd hate to see it go. Same for the house. This intersection is desperately in need of rejuvenation, though, especially on it's north-east and north-west sides. The buildings there are in notably awful shape. I find it interesting that Church Street has been so immune to development in this recent boom. It's a street that does excellently, despite it's crumbling buildings and extortionist rents. there was a project at dundonald which have been 25 stories but it wanted to wipe out historic buildings so got kaibashed. another application up the street is around same height in the open field on a corner at isabella i believe. 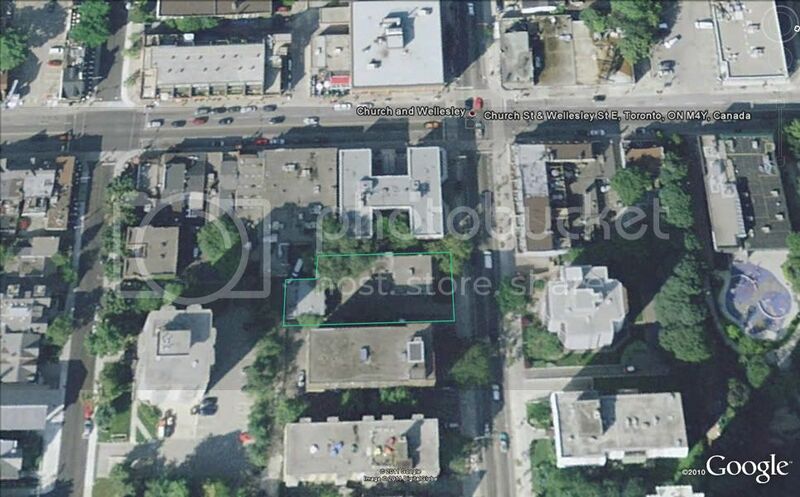 There's another dev coming someday further up Church St, close to Bloor St, that involves a bunch of old houses etc. Wow, they just keep targeting the Village. I'm generally a pro-development kind of guy, but right now I just wished they would leave Church Street the way it is (although some renovations would be nice). I'm glad that the Church/Gloucester proposal got withdrawn earlier this year. Facadism incorporating houses and nice old apartments just looks awkward and unnecessary. Church Street (south of Gay Village), around Carlton is where this is needed to fill in the ugly parking lots and incomplete streetscape. They should leave Church St. alone between Alexander & Isabella. I'd like to see that whole strip receive a special designation so that any developments are heavily scrutinized. There's nothing wrong with the building on the n/w corner, it's in good condition save for mountains of pigeon poop. On the n/e corner is a fabulous building but it desperately needs some serious attention before it collapses onto itself but it should never be considered for redevelopment. A case could be made for full restoration of the front west & south sides and then rentals built in behind making full use of the lot and create proper sized apartments - and more of them. 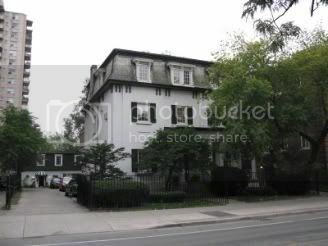 As for 501 Church/77 Wellesley I can't believe anyone is entertaining tearing down that perfectly good building. Everything here works, why break it? 1. Directs the Acting Director, Policy and Research, to report back to Toronto and East York Community Council on the possibility of designating the building at 81 Wellesley Street East under Part IV of the Ontario Heritage Act. Summary The building at 81 Wellesley Street East is an architecturally significant structure but is not currently protected by heritage designation. The building is clearly a surviving part of the early neighbourhood development of this area. In order to preserve the building as an important heritage resource, I am requesting City staff undertake a process to review it for designation under Part IV of the Ontario Heritage Act. This (heritage designation) should have been done years ago...may be a little to late to save the old heap.